If you wish a longer and more individual ride through the forests you’d enjoy Arctic Expedition. You can select from 3, 2 or 1-hour rides. 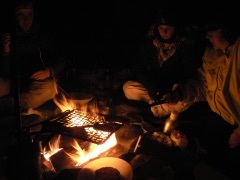 In Arctic Expedition 3hrs we enjoy half way a customer selectable snack by a fire by a lake. In Arctic Expedition 2hrs a basic snack is enjoyed when back at the base camp. 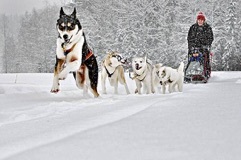 When there’s snow, our huskies will pull you with a dog sled. If there’s not enough snow, you’ll enjoy the ride in a dog cart. When it’s hotter than +15C we organize Husky Hikes only, as it’s too hot for the huskies to run. We have a limited capacity, so please look at our program times and reserve your seat quickly from our customer service. You can pay in cash at the event. If you wish to ride at a different time, we’ll do our best to organize it, too. 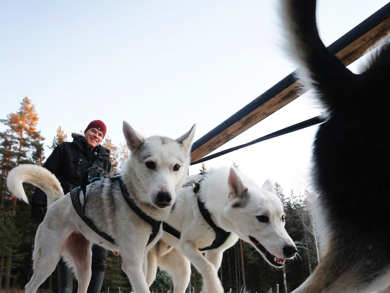 It is time to enjoy the Finnish nature in all of its beauty in a longer mystic sled-dog ride: Meet the dogs and hear on dog mushing. Prepare yourself for the ride. 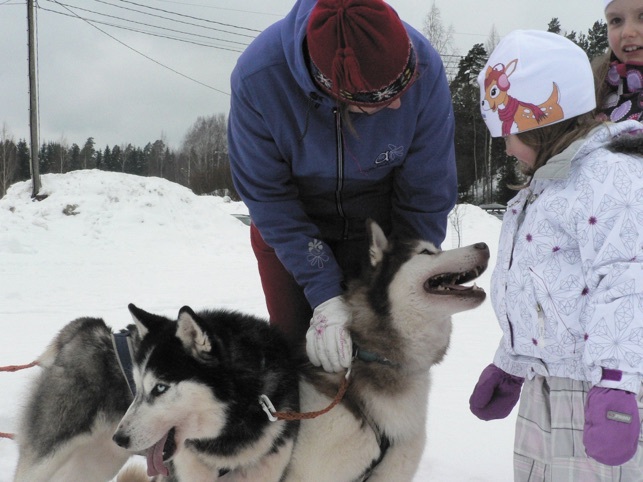 You ride safely through the ups an downs and twists of Nuuksio landscape, our 5-6 huskies per sled or dog cart giving you a great ride. We drive together in a group with many sleds, dog carts or kickbikes a distance of 8-10km. Our guides drive in front and at the back of the line to ensure of your safety. In winter, you yourself can drive a sled between the guides - or relax as a passenger. 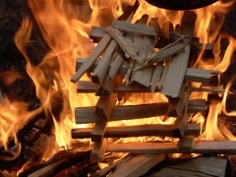 We’ll stop to build a fire and have a nice snack of Finnish specialities (etiher pancakes with jam and whipped cream by the fire or beef & salmon sandwiches, carelian pie and pastries) and coffee, tea or juice. Our camping place is by a beautiful lake, which is all frozen in the winter. That special coffee ‘nokipannukahvi’ cooked by the fire sure tastes good! At the base camp it’s time to share memories and relive the experience. Fetching from the nearest bus stop is included in the price. If you wish for a bit shorter expedition, Arctic Expedition 2h is good for you. We’ll drive a shorter track than in 3h-version, turn back and enjoy of a hot drink by the fire at base camp. The special coffee ‘nokipannukahvit’ tastes good. Tea or juice are also available. 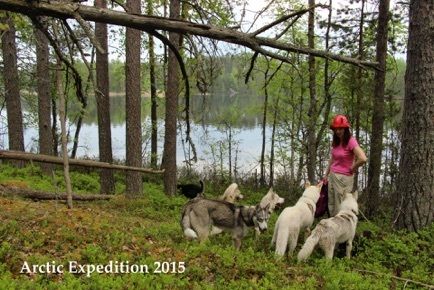 Our experienced sled dog guides are with you all the time. Fetching back/forth from nearest bus stop is included in the price. This our shortest expedition-product. 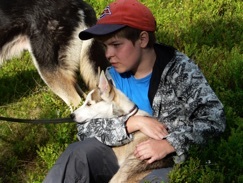 Get to know the huskies and sled dog riding. 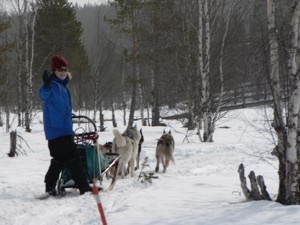 We drive with a dog sled, dog cart or a kick bike about a 2-4 km track, after which we enjoy of a hot drink from thermos. During snow time, this experience is best suitable for 1 person or a group of 3 persons. If you are a group of two, one person is driven first, after which we come back, switch and the next person drives. When there is no snow we ride with a dog cart or drive a kickbike pulled by a husky. Fetching back/forth from nearest bus stop is included in the price. 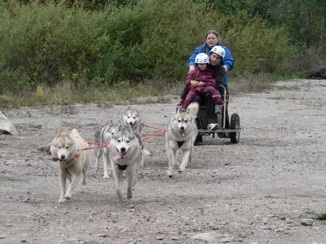 Experience sled-dog-driving with a kick bike or a dog cart. The friendly Siberian Huskies of Arctic Expedition are waiting for your hugs. 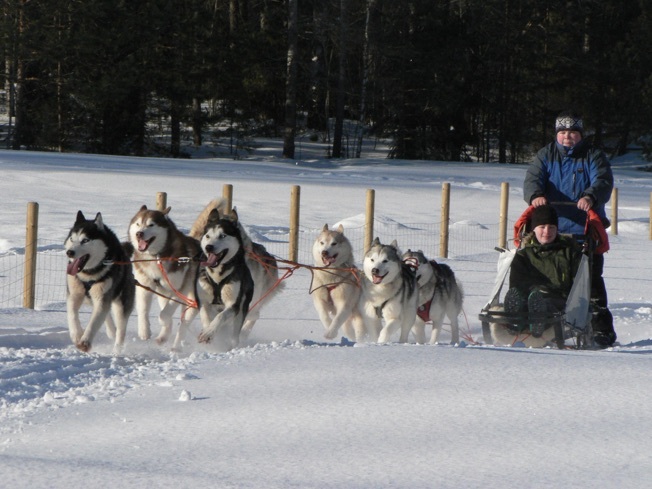 Price includes getting to know our furry friends, driving instructions and one round of sled-dog-driving on a safe track. Note! 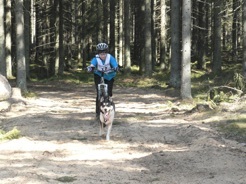 Arctic Husky Ride’s are only organized during special, limited times during mass events. 30€ for a person, adult or child. Wishing something new for your customer event? Wishing a memorable relaxation day with colleagues? Wishing to come to your wedding with a dog sled? 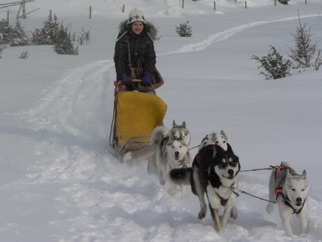 - We organize also tailored sled dog rides and -events. 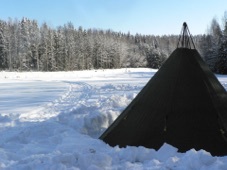 Enter the Kota - the traditional Sami tent - and hear stories of the Arctic. Prepare for the ride. Meet the huskies. 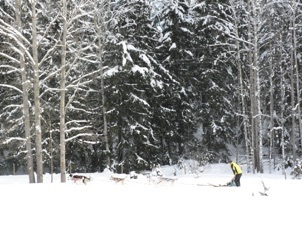 Ride on a short but safe track of 0.5-1km pulled by 3-6 sled dogs. If you wish, you can also drive yourself! 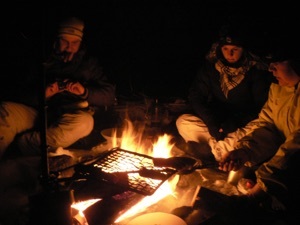 - Relive the experience by an open fire in the Kota. Hot drink is included (”nokipannukahvit”) Suitable for people of all ages. 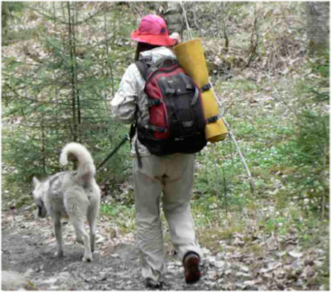 Hike in the Finnish forests with a Siberian husky. Our experienced nature guide and our lovable dogs guide the group in a nice walk through the beautiful forests of the Nuuksio National Park, Espoo, Finland. 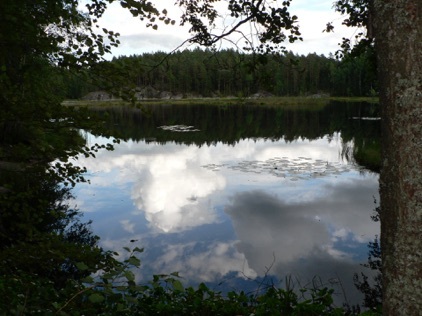 You’ll hear stories about Finnish nature and about huskies. All prices include VAT. Please makes sure you have enough cash to pay for the ride. Unfortunately at this point of time we don’t accept debit or credit cards. 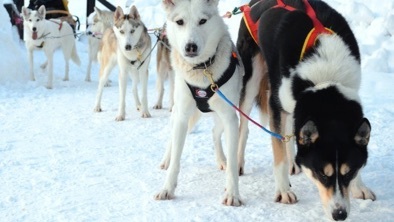 Billing is possible for companies purchasing Sled dog events or tailored programs. All our prices also include a liability insurance. Sled dog riding is not a dangerous sport, but please make sure you are personally insured against accidents. Please look at our calendar to see the available times and reserve your time from our customer service, as we are filling our schedules early. 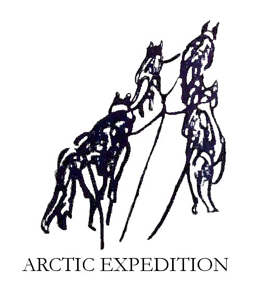 You can also come to our Arctic Expedition -rides without a bigger group. Persons coming solo, will need to pay 30€ extra. It is easy to reach us by train and bus. When you come to our Arctic Expedition experiences, fetching from the last bus stop is included in the price. For connections, see here. 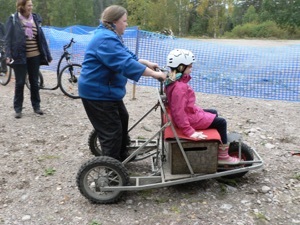 Sled dog riding is suitable for all ages. Normally fit people can drive our dogs themselves. 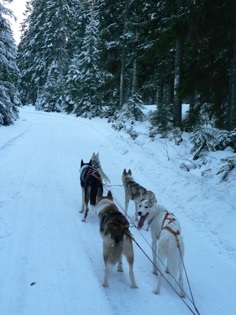 As sled dog driving is also a physical activity, you may also want to ‘just relax and let the guide drive you’ :). Driving yourself is only allowed during safe track and weather conditions. Warm outdoors clothes, boots, hat and gloves are needed. When we drive with kickbikes or dog carts, you are provided with a helmet, goggles and gloves. During winter we’ll bring some overalls, gloves and boots for you to wear. If it is rainy, we’ll bring some rain gear. What are the husky experiences you offer? What are the differences of the husky experiences offered? Do you really organize husky rides when there is no snow? I want to know more about your beautiful dogs? Do you have any husky puppies? How much do your husky rides cost? When do you arrange the husky experiences? I travel solo. Is it possible to join? What kind of clothing is needed? What have your customers said about your dog rides? How do I book your husky ride? If you have any further questions, please contact our customer service. We are happy to help you.